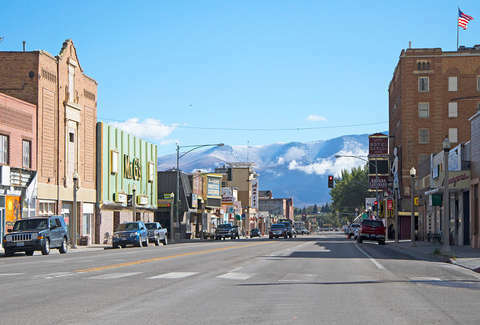 Welcome to Ely, where treasure hunting and legendary old west outlaws are intertwined with mountain biking through ancient pines, storied eateries, and an eclectic art scene -- all served with small-town friendliness. What started as a stagecoach stop and trading post in the 1870s has transformed into a charming Nevada mountaintown and outdoor haven -- whether it’s first snowfall or the thick of summer. Sitting at the eastern edge of Nevada’s "Loneliest Road in America,” Ely needs to be on every explorer’s map. With the most 11,000-plus-foot peaks in the state and the only national park situated entirely in Nevada, Ely’s White Pine County is your jumping-off point for diverse outdoor adventures. Start by heading to Cave Lake State Park, where activities include ripping through 20 miles of trails via mountain bike or ATV and enjoying the winter scenery while ice fishing in its 32-acre trout-filled reservoir. If you're looking to stay overnight (and you definitely should be), you can rent a yurt and embrace natural beauty early in the morning. The outdoor adventure doesn't end there, because just an hour east of Ely is Great Basin National Park where plenty of summits, towering Bristlecone Pines, bighorn sheep, and the subterranean passages of Lehman Caves await you. The excitement isn’t over when the sun goes down, either. 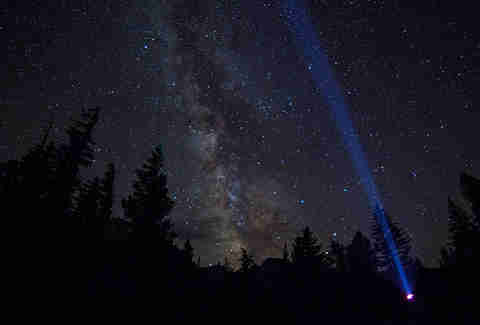 The park boasts some of the darkest skies in the US, so prepare to ponder the meaning of life as you take in millions of star clusters and The Milky Way -- all visible to the naked eye on clear, moonless nights. When your legs (and eyes) eventually need a break from all the exciting sightseeing, set up camp at 10,000 feet at the Park. If you don't plan on making an overnight stay of it, make your way back toward Ely savor the natural solitude at The Kirch Wildlife Recreation Area, where you can catch a Nevada sunset while soaking in the crystal-clear hot springs. It won’t be easy to tear yourself away from the natural beauty that surrounds you, but it’s worth it for the thriving arts scene in downtown Ely. Take your time wandering through the 11-block art walk on the main drag, dotted with more than 20 public murals and a sculpture garden illustrating the town’s rich and diverse history. Make sure not to pass by what only looks like a regular bank on Aultman Street. 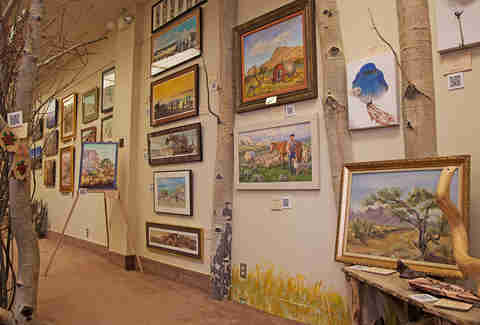 Ely Art Bank is an art gallery and cultural center that has a collection of eclectic local art, including photography, furniture, handmade crafts, and jewelry made onsite by two sisters from the Shoshone tribe -- all inspired by life in the Great Basin. You’ll also be encouraged to step back into funkier times by the McGill Drugstore Museum, a working drugstore from the ’70s with an old-school soda fountain that doubles as a perfect window into historic McGill. For architecture and movie fanatics, thoughtfully admiring the ’40s-era art deco details inside Ely’s historic Central Theater before catching the latest films is a total crowd pleaser. It’s natural to feel like a bank-robbing outlaw straight out of Red Dead Redemption 2 in Ely, thanks to its storied beginnings as a booming copper-mining town. 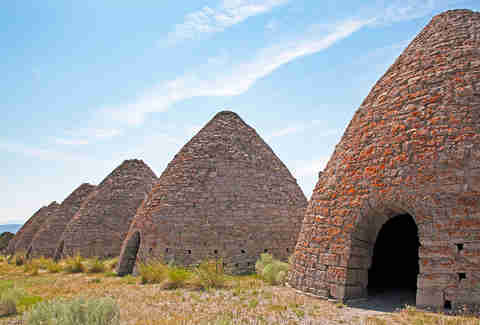 Start with a tour of Ward Charcoal Ovens State Historic Park, an abandoned smelting operation used to process rich silver abundant in the region in the 1800s -- and also casually rumored to have sheltered stagecoach bandits running from the law. White Pine County boasts over 20 ghost towns from much wilder times to roam, including Cherry Creek Ghost Town, a mining town along the original Pony Express Route with original structures and a museum to check out. And don’t worry, there’s still plenty of treasure to ride away with into the sunset. At Garnet Hill Recreation Area, anyone can hunt for the geological specimens lodged into the volcanic rock of the Eagan Mountain Range. If you don’t dig up any, you can still purchase some as a memento at Garnet Mercantile. Nobody will call you out. Even if you dreaded American history in high school, the town has a beautiful habit of converting every bored skeptic into a proud nerd. Kick it off in the 1900s by touring original miner cabins in Renaissance Village, complete with historic artifacts of the era representing the melting pot of cultures that were drawn to Ely in its copper-mining heyday. Once your curiosity is piqued, head down the road for the joy ride of your life on one of the last continually operating steam locomotives of its kind. Established in Ely in 1906 to connect a massive copper mine (which is still in operation) to transcontinental routes, Nevada Northern Railway is pulled by century-old engines through the Egan Mountain Ranges in an open-air car. Whether it’s the Star Train built for -- you guessed it -- stargazing throughout the Great Basin, or the beloved Polar Express that runs between Thanksgiving and Christmas, it’s the closest you’ll ever get to jumping into a time machine. But your trip on this impressive historical artifact is incomplete without a visit to the East Ely Depot State Museum, which features fascinating relics from the operation's business end. All that exploration requires some serious refueling and recharging. 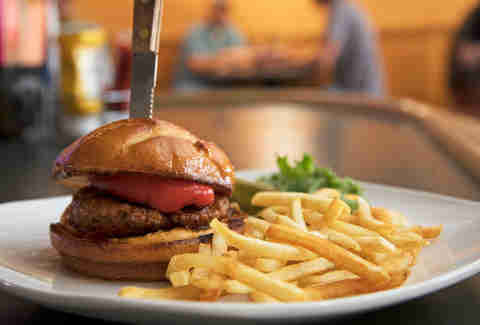 Thankfully, Ely hosts a range of top-notch cuisine and libations all within the city limits. As if being home to an acclaimed Basque chorizo burger wasn’t enough, the city also offers bespoke foodie experiences only Ely could dream up... like indulging in steaks and fine wine in a jail cell. Jailhouse Casino's Cellblock Steakhouse is worthy of a last meal, though you're more than free to visit the sports bar and lounge after dinner. 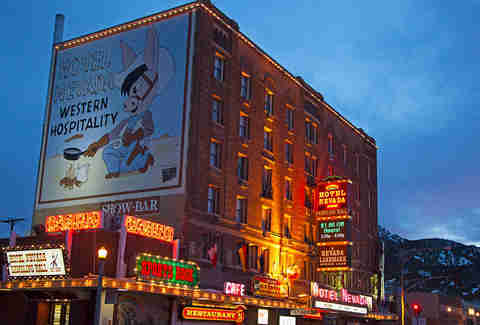 Continue unwinding across the street inside the famous Hotel Nevada. Adorned in retro neon, the downtown staple was founded during Prohibition -- back when they secretly served up bathtub gin and moonshine -- but the drinks are far less surreptitious these days. Visitors sticking close to Great Basin National Park can find craft cocktails and artisanal pizza (pico de gallo pie, anyone?) at Baker’s seasonal Stargazer Inn. The menu there is constantly changing, but is perpetually delicious, featuring fresh baked goods from scratch daily. They also have the best wine and liquor selection for 100 miles around. Be sure to the order up the honey and gin flavors of a Neal Cassady cocktail, and raise your glass to the stars. The sky’s the limit here.